Elena had a dress up day at school a little while ago. I asked her what she’d like to go as and the answer was predictable. Elsa! She wanted to be Elsa. I took a deep breath and a drive to Spotlight. The result? 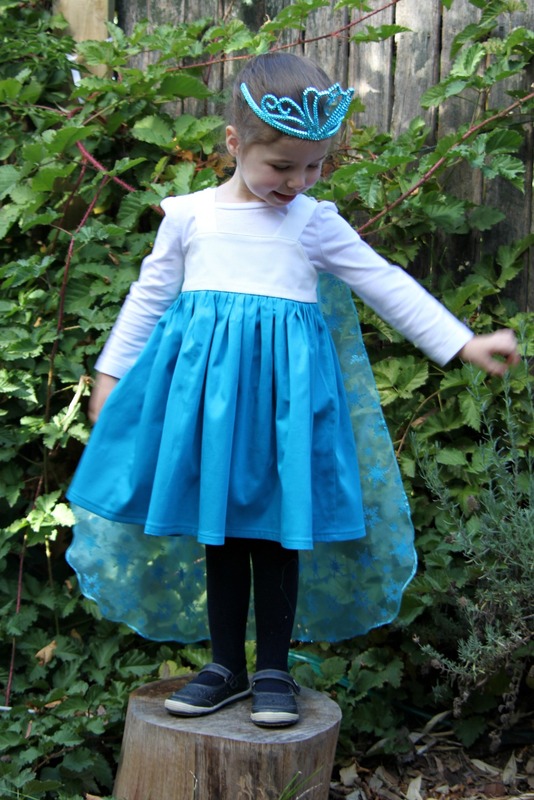 A Grace dress, in the required colours with a detachable cape. A crown from the $2 shop. Win. I winged the pattern for the cape – a rectangle (with rounded corners at one end) finished on three sides with a sewing machine rolled hem, with the raw short edge sandwiched between some bias binding-esqe fabric off-cuts. I sewed a hair elastic, chopped in two, into each end. It’s attached to the dress straps with buttons. It’s definitely not perfect, but it did the trick. Elena was delighted, and very excited to be one of the crowd of Elsas in her class. She was so hyper I couldn’t get her to stand still for pictures. She was too busy trying to turn me to ice. The poor teachers – when I arrived at pick up time they were showing the kids the ‘Let it go’ film clip. Their reasoning? They’d had to listen to it all day, so we should have the same on the way home. Touché. Pattern: Boo! Designs Grace Dress, self-drafted cape. Fabric: Cotton sateen from Spotlight. Cape fabric from Spotlight too. This entry was posted in Boo! Designs, clothes for children, sewing. Bookmark the permalink. Let it go! Let it go! hahaha Sorry could not resist, just had to rub it in 😉 Of course Elena was super excited! Her Elsa outfit is perfect 🙂 and I am also somewhat relieved she did not turn you into ice! I know right? It’s either being turned into a frog or ice in this house. Or being put in time out (I always ask if I can take my knitting…. ).